After vaping with an Aspire Nautilus and a Kanger Protank for a few months, it seems most useful to review the two together. They have the same general configuration and fill the same niche, but are noticeably different in design and function. The Nautilus reviewed below was purchased from Viper Vape and the Kanger Aerotank from My Freedom Smokes (although Litecig has them for less now). Adjustable airflow is the signature design feature of both of these tanks. Both are of the bottom dual coil (BDC) design, have replaceable atomizer heads and Pyrex glass tanks sandwiched between stainless steel housings. That’s where the similarities end. The Aerotank seems to take its design cues from a rebuildable atomizer. It looks like a thinner version of a Kayfun, only with more glass. The relatively thin form factor results in a 3.8ml capacity. The base of the tank section incorporates a crossbar design like that of the Anyvape Davide which undoubtedly increases rigidity and provides a means of connecting the top and bottom of the housing, but also restricts filling to a degree. Unscrewing the base of the tank from the center post allows both ends to be removed from the glass for cleaning. Overall there is a nice heavy feel to the unit and the solid stainless drip tip adds to the effect. The atomizer head is quite similar to the head on Kanger’s earlier single coil Protank series, but with an elongated form to handle dual coils. The coils sit one on top of the other with a piece of wick separating the two. Short wicks protrude from the coils and into the tank in much the same way as the single coils do. The chimney that caps off the coil section protrudes into the air tube. The big change from the Protank lies in the base of the tank. A knurled ring now allows for adjustment of the airflow. Turning it clockwise changes the airflow from quite airy to completely closed by restricting the single air hole on the side. The design of the Nautilus is completely different, both from the Aerotank and from any tank that came before it. It’s a rather wide tank that allows for a 5ml stated capacity. The glass section of the tank is capped by metal at each end, but the top of the glass narrows into a threaded section where the top cap screws on, making for an exposed curvature of glass at the top. The result is a somewhat more fragile look, but one that gives a clear view of the eliquid within. Also unique is the way the atomizer head connects to the tube of the tank. The head screws into the base, but then also has threads that screw into the center tube, effectively clamping the glass between the top cap and base. 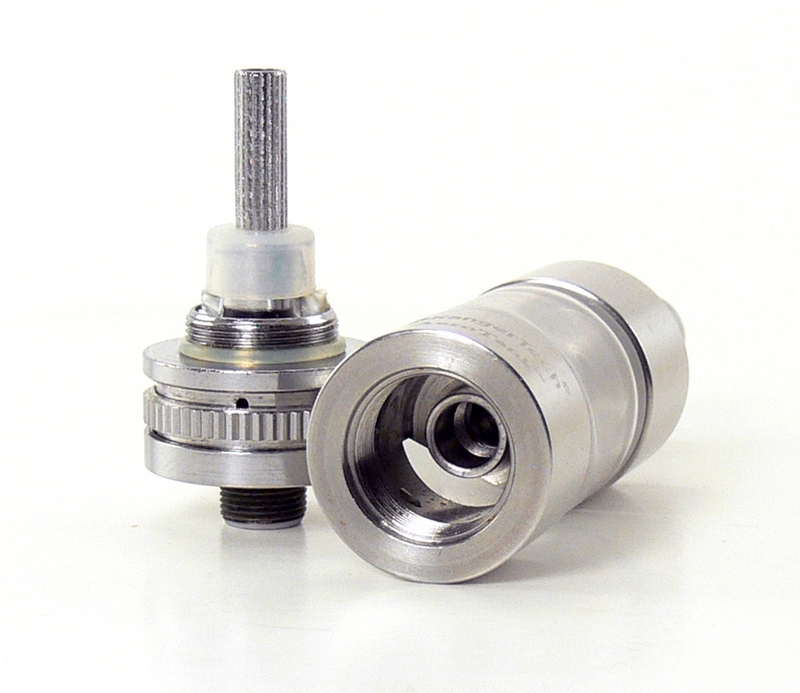 The top cap does screw onto threads on the glass, but the base is held in place entirely by the center tube connection. A substantial gasket on the base leave no doubt as to whether things are airtight or not. 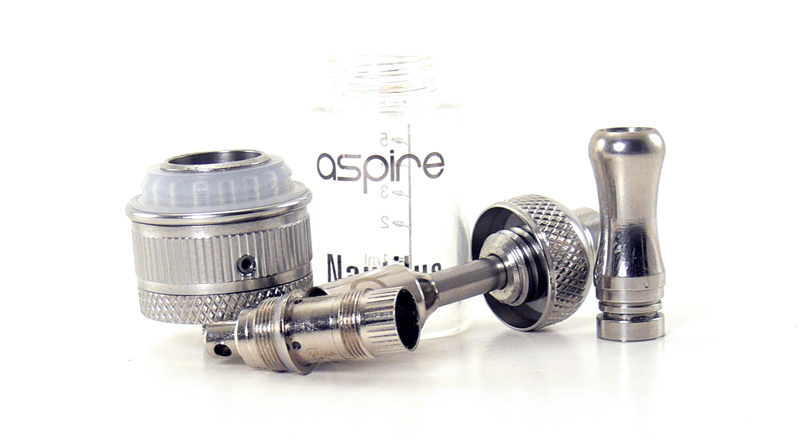 The Nautilus dual coil atomizer head also uses a stacked coil arrangement, but has a fiber lining around the inside of the tube rather than protruding wicks. Eliquid enters the tube through two holes in the tube and is then transferred to the coil via the fiberfill. The setup is quite similar to that of a cartomizer tank. The airflow control of the Nautilus is a great design. The knurled ring at the base turns to four different selections, ranging from fairly restricted to wide open. The settings seem to be spaced just perfectly for a wide range of airflow preferences. I must say initially I didn’t even think I wanted to spend the time on a comparison. Right out of the box the Nautilus seemed like it was not up to the task. After filling and allowing things to soak for awhile I was rewarded with repeated dry, burnt hits. Blowing bubbles in the tank between hits was the only way to get anything approaching a good vape at any of the selected airflow settings. The Nautilus actually handled this well, with no leaking through the base that could reasonably be expected. Finally, I replaced the coil head with the second one supplied in the package and wow, what a difference. From the start, the second head was providing a nice warm, flavorful vape, and quite consistently. Quality control strikes again, I suppose, but I am at a loss as to why there should be such a remarkable difference between the two heads. At any rate, the fight was on. 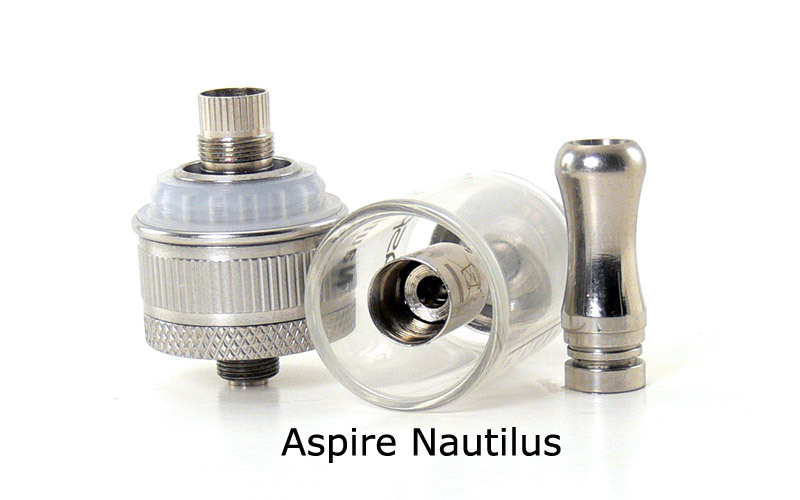 The difference in vape quality between the Nautilus and the Aerotank is negligible, although the Nautilus probably comes out slightly ahead in terms of flavor. Both provide a great consistent vape at both lower and higher voltages and both allow for just the right amount of airflow to be selected. The airflow adjustment on the Aerotank certainly provides more precision, but I found the air hole to be a little difficult to see sometimes, making it hard to tell where things were set. It also is a little more prone to accidental adjustment. The Nautilus is easier to set thanks to the stops when turning the ring, but the difference between each hole size can also be a little difficult to see. Suffice it to say that simply turning the dial until the draw is right is the easiest way to approach both models. Neither of these tanks exhibited much of the dreaded gurgling that plagues so many bottom coil clearomizers. The Aerotank will sometimes gurgle a little after repeated use, but only rarely. Leakage has been non-existent in either of them, either at the battery connection or through the mouthpiece when filling. This achievement is nearly as noteworthy as adjustable airflow. Ease of filling is one area where there is a clear winner. The wide opening between the tank wall and center tube of the Nautilus make it incredibly easy to fill. Not so much with the Aerotank, which has only small slot in the metal tank bottom for filling. Filling it takes either a needle tip or just the right angle, dripping juice along the sidewall and into the tank. The advantage on price is also clear. 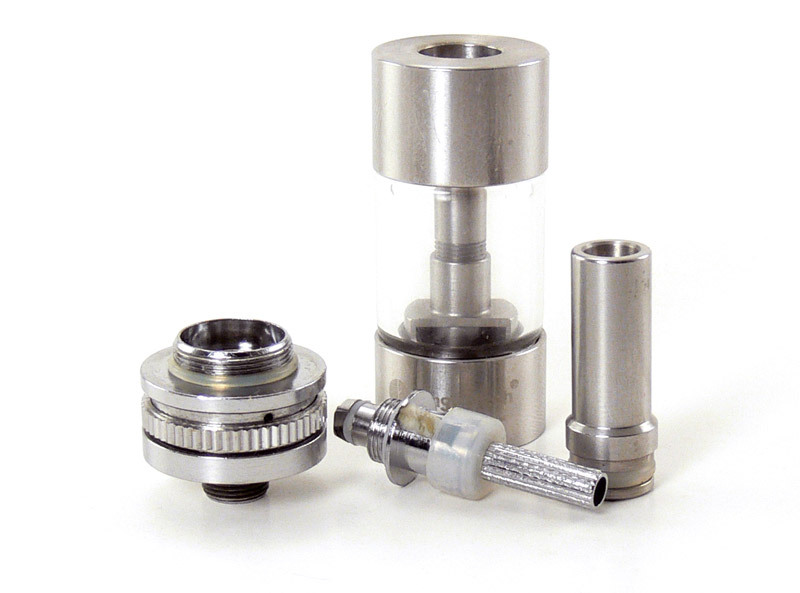 The Aerotank is readily available for between $20 and $25 with replacement heads running around $1.80. 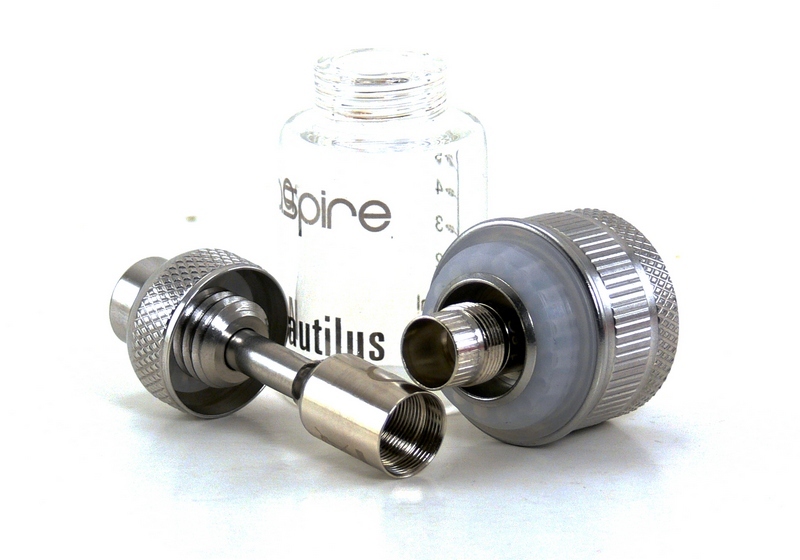 The Nautilus retails for $25 to $35 at most vendors with replacement heads typically around $3 each. Both units come as a kit with two heads included. In addition, the heads on the Aerotank are relatively easy to rebuild to save on replacement costs, while the Nautilus heads are considerably more difficult. If you do decide to rebuild, please be sure to test! Dual coils in a small space can create a short very easily. I hate to admit it, but this isn’t going to be much of a conclusion. After an extended use, I find myself using both of these tanks at nearly the same rate. I’m using the Aerotank for much of the day mainly because it seems a little sturdier for pocket duty. But the Nautilus has become a favorite on my desk in the evening. I’m not sure I could pick one, and I guess my best advice is to try both. You won’t be disappointed either way.